So you can build a drone. You can fly a drone. In your backyard. In your neighborhood. But how about this: pack it up, travel to Africa, find a little-know waterfall called the Aruu Falls, traverse a river, hack out a helipad with a machete, and then fly a drone. Now that is insane! But we did it. With intense humidity, water everywhere, rocks to scramble -- but it was a blast, as you can see. Alas, not all adventures have happy endings. 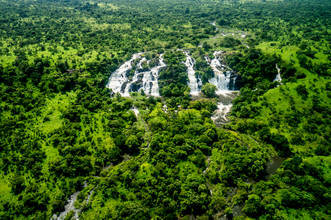 After our escapade at the falls, we visited the second-largest waterfall in Africa, Murchison Falls. One of the rotors on our drone unexpectedly shut down at 150s altitude, and we are sorry to say the quadcopter now rests at the bottom of the Nile among the skeletons of hippos and crocodiles. APC Propellers 11X47 SFP Style or Graupner Elektro 11"x 5"